Currently Bill resides on California’s beautiful Central Coast. He continues to have a passion in the broadcast world and working in local media. Bill has developed a love of writing and is excited for the release and launch of his first novel. Murder at Broadcast Park is a murder mystery/thriller written by Bill Evans. John was getting used to his position at the station as the assignment editor. It always did seem rather odd to him that he, the new kid who had just finished college, would have such a major hand in deciding what would be covered as local news each day. His daily routine started with him opening up the station. He would turn on the lights in the studio to give the room a chance to warm up before the AM newscast and then get to work on determining the day’s assignments for the reporters. And that was exactly what was on his mind as he began to open up the station on the morning when he found Steve Johnson’s body. Johnson was the Santa Barbara station’s most popular news anchor, and had been so for over ten years now. John found his body in the oddest of positions. He was sitting at the news desk with a rope around his neck. The young man eased Johnson down onto the ground on the off-chance that the man might be resuscitated, but soon realized that it was way too late for him. News Director Barry Burke took early morning phone calls in his stride -- it was expected in the news business, but his assignment editor’s call took him completely by surprise. Their local TV news station had suddenly become the news, and it would take everyone’s resourcefulness and skill to stay on top of it. 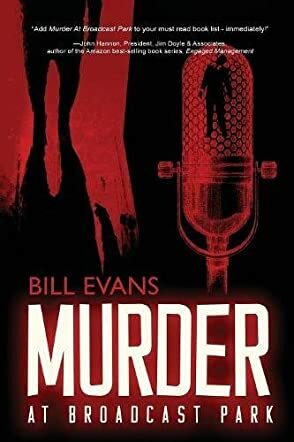 Bill Evans’ murder mystery, Murder at Broadcast Park, is an exciting and fast-paced thriller that follows the investigations of the police and the station’s investigative journalists’ attempts to solve the mystery of the deaths of two station employees found in different locations on the same morning. Evans’ own 45-year career in broadcast journalism gives this well-written and suspenseful debut novel a strong feel of authenticity. The author quickly had me immersed in the personal and professional lives of John, his boss, Barry, the Station Manager, Lisa and Stewart Simpson, the station’s owner and her long-term friend and lover. Evans also incorporates a police procedural aspect to the plot with his inclusion of the Santa Barbara police detectives who work cooperatively with Barry and his journalists. Murder at Broadcast Park is a fine blend of mystery and dark thriller, with elements of horror that work perfectly to keep the suspense honed to a sharp edge, and it’s most highly recommended.